During spring 1999 Dr. Richard Brumpton discovered, among a batch of commercial primrose seedlings in a neighbouring nursery, a primrose plant with unusual lobed leaves. He originally called it the chrysanthemum primrose as the leaf lobing was reminiscent of chrysanthemum leaves. It was not in flower at the time; flowers when they bloomed proved to have an excessive number of very narrow petals. The plant was fertile and produced both wild type and lobed leafed seedlings; the latter exhibiting some variety in the degree of lobing of the leaves. In a letter Richard sent to me on 21 st September 1999 he commented that his brother Chris who was potting up the crop of seedlings had spontaneously begun referring to the Oak Leafed primrose and the name was adopted from that point onwards! Besides the leaf abnormality the attenuation of the petals varied in degree from seedling to seedling. Nothing resembling this form has been either illustrated or described in our old literature. As holder of the National Collection of Primula British Floral Variants I am always keen to collect new variant forms and in spring 2000 Richard sent me a division of the original plant and some of his spare seedlings. I was at this time working on a part time PhD studentship with the University if Leeds researching various aspects of Primula mutations. I was thus able to include Oak Leaf, which proved to be invaluable. On investigating the inheritance of the form I found it to be a dominant phenotype and also found that Oak Leaf was linked to the S locus. It was not the first phenotype I had found where the mutant allele was linked to the S locus there were others that I had identified previously. This allowed me to carry out linkage analysis and determine gene order a study which filled an entire chapter of my thesis! Results showed Oak Leaf to be on the opposite side of the S locus to Hose in Hose and sepaloid to be on the same side as Hose in Hose (Webster 2005). Oak Leaf was first shown to the public as part of a non competitive display of my National Collection at the Saltford Primula Show on 21/04/01 where it attracted considerable interest. The first published account of the new form was in 2002 in Richardss article for the National Auricula and Primula Society Yearbook ( Midland and West section) which also included the first published photograph of a Hose in Hose/Oak Leaf plant in flower. In 2003 I included Oak Leaf in an article for the National Auricula and Primula Society Yearbook, Southern section, giving details of the inheritance of the phenotype. A problem encountered with early progeny was that the flowers frequently had a tendency to break down and become split and ragged later in the season or at least by the following year. Some breeding work was required to stabilise the flower form. An occasional more extreme Oak leaf seedling might also develop ectopic shoots on the leaf veins (one even developed an ectopic flower)! Ectopic developments are those developments that occur in an inappropriate place. This phenomenon and the leaf phenotype bears some similarity to Arabidopsis and tobacco plants genetically engineered to ectopically express the KNOTTED gene from Maize (Chuck et. al. 1996), but no work on the molecular genetic basis of the Oak Leaf phenotype in Primula has yet been undertaken. Both Richard and I carried out crosses that combined the new Oak Leaf form with other forms. Particularly attractive is the combination of Oak Leaf and Hose in Hose polyanthus illustrated in Richards article of 2002 (see above), the feathered form was unremarkable, and Oak Leaf appeared to combine less well with Jack in the Green in that to date the leafy calyces have been so small as to be barely noticeable. Oak Leaf sepaloids have no horticultural merit whatsoever and are of scientific interest only (Webster 2005). The triple mutant, Feathered/Oak Leaf/Hose in Hose, is quite strange and attracted a great deal of attention as part of a display of my collection at Saltford Primula Show on 20/04/02. Combination of Oak Leaf primrose with wild cowslip produced an attractive hybrid. These hybrids and other polyanthus hybrids caught the attention of E. Horrigan of Vale Royal Horticultural Ltd. who has since supplied the first commercially available polyanthus Oak Leaf plants. They were sold in small quantity only in 2005, and more generally in 2006 under the name of Royal Oak Leaf The majority were in yellow but some reds were also produced. 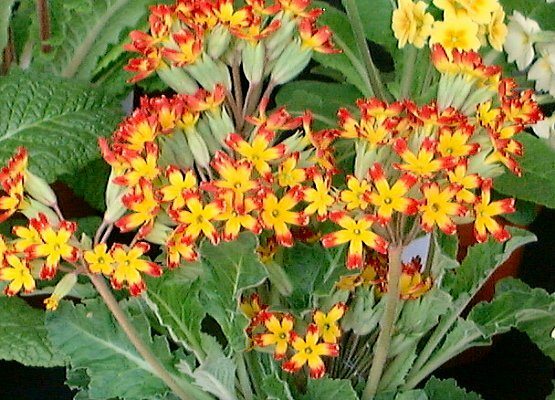 More colours will follow in due course, and primrose forms are also expected to become generally available in the near future. I begin showing plants on a competitive basis again in 2006 (having obtained my doctorate in 2005). Among the plants that I staged competitively in 2006 were Oak Leaf primroses and polyanthuses. They took first or second prize in their classes a sign that these plants certainly have horticultural merit.